Be 100 percent positive about the safety of the place you live and work. Have a qualified electrician inspect your home and business electrical systems, especially if you can’t remember the last time this happened. You may have faulty wiring, a code violation or another electrical issue that you are unaware exists. Rest easy knowing any electrical repairs have been identified and repaired by a professional. Can you answer this question: When was the last time a qualified electrician did a thorough inspection of your home or business? It’s recommended an electrical inspection be completed annually or even immediately, if any obvious concerns are identified. Signs of concern could include flickering lights, sparking at outlets or overloaded circuits. Hiring an electrician to inspect the wiring and other electrical components may identify any issues that could cause power outages or fires. Having your commercial property inspected on an ongoing basis must be done to ensure employee and customer safety, as well as to protect assets. After all, you don’t want to end up another statistic. The U.S. Fire Administration reports electrical fires as a leading cause of fires every year. On the positive side, a certified electrician can check your home and business for overloaded circuits, faulty wiring, damaged outlets, under or oversized breakers, grounding issues and other potential risks. They can even do the repairs to enhance the electrical system’s safety for you, your family and coworkers. You can blow a fuse or trip the circuit breaker, overloading the system, by plugging in too many devices in one outlet. This can be a dangerous situation. One solution would be to check the system for faulty wiring or redistribute the load to other circuits. 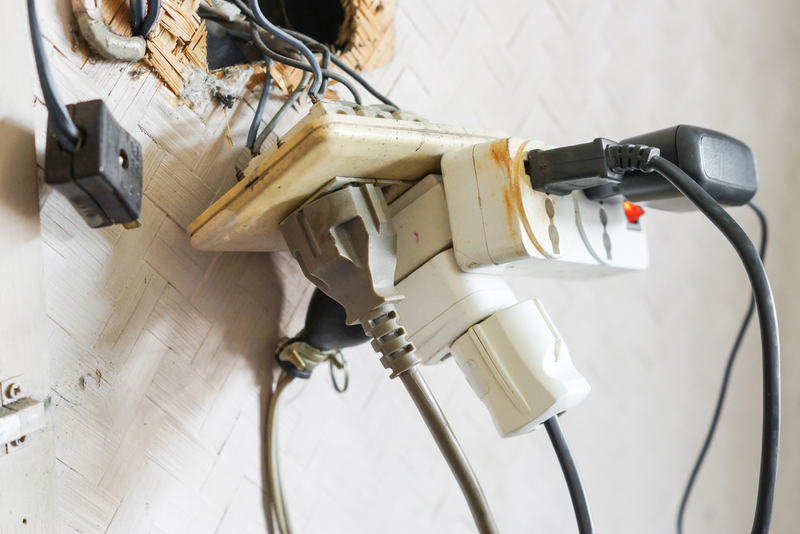 An electrician may also expand the number of circuits to safely handle the power load. In structures more than 40 years old, you may have aluminum wiring. This has proven to pose a fire hazard. You will usually need to have your home or business rewired by an electrician with a more traditional copper wiring option. Faulty or damaged wiring can definitely be hazardous. When installing new lighting, fans, speakers or any other devices that require wiring, it’s advisable to hire a professional electrician to ensure everything is wired correctly. Often times, the way faulty wiring presents itself by sparking or releasing a burning smell. Circumvent the risk by having the work done by a professional. You will want to make sure to have the right size circuit breakers at home and at your company. If they are too small, the breaker will unnecessarily restrict power flowing into the building and cut off electricity. Too big and they will fail to shut off dangerously high levels of current. Either of these problems can pose a hazard. When we inspect your home and business electrical systems, we make sure each circuit has been properly grounded. Each circuit breaker box, receptacle and home or office appliances should be grounded. This greatly increases safety. The National Electrical Code requires each structure to have a grounded system. This system actually connects to a rod buried in the ground. This offers protection because the earth harmlessly disperses the full impact of any over-current or short circuit. This eliminates the danger to anyone who might otherwise receive a jolt of electricity. Have you noticed that multiple outlet extension cords, office copiers, microwaves and other items have an extra prong? This grounds them to outlets that can handle the extra burst of electricity these items sometimes draw. Another top cause of electrical fires includes faulty lighting. Make sure you check the correct wattage for light bulbs to operate in each fixture, including lights in your company’s parking lot. Henderson Electric of NWF prefers to use LED lighting because of the greater energy efficiency and long-term savings on power bills. Additionally, know that you can greatly enhance safety in your home and business by keeping flammable material, such as a cloth or paper, away from any light sources. Light sources can generate heat that may spark a fire. Having up-to-date Smoke, Fire and Carbon Monoxide Detectors and Alarms is important because they alert people to a potential fire or gas leak and often save lives. Because of their critical importance, the Fire Administration recommends testing your smoke, fire and carbon monoxide detectors at least once a month. It also suggests changing batteries once or twice a year. Additionally, professional electricians also will check your sprinkler systems when they inspect your home and business electrical systems. Today’s electrical safety codes call for installation of fire sprinklers in certain size homes, condos, offices, hotels and various other types of structures. This requirement provides the highest level of safety to buildings. Get the peace of mind that comes from knowing your building, equipment, appliances and other devices undergo regular testing and inspection to protect your family, coworkers and customers from harmful electrical issues. You can count on our experts at Henderson Electric of NWF to conduct a thorough inspection of home and business electrical systems and prevent disaster from striking! Contact us today to schedule an appointment.